A “friend” suggested I try this,Â because, unbeknownst to me, he had previously sampled it and found it revolting. Though I did not find it spectacularly disgusting (to my friend’sÂ disappointment), it is certainly pretty lame compared to how awesome root beer floats actually are. The flavor is off and leaves anÂ unfortunateÂ aftertaste, but the major failure is in the lack of texture you wouldÂ associateÂ with a root beer float. 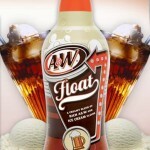 Effectively the A&W rootbeer float in a bottle is to root beer floats what astronaut ice cream is to real ice cream. To be fair, this “friend” DID purchase the drink for you, and even offer the magnanimous sum of $1 were you to finish it – which was turned down. This review also fails to accurately capture the absolutely vile aftertaste that the drink leaves in your mouth, due primarily (I think) to the fake “vanilla” flavoring used in it. Also, I have not tried the similar Sunkist drink, which is supposed to taste like an orange creamsicle. Nor do I plan to. I think Stewarts makes a decent orange creamsicle drink. If not them, some other brand we got out west on our cross-country trip. Sioux City soda or something. They also make sarsaparilla.